Every once in a while, people who work with spirit communications may find themselves dealing with something that isn’t quite what they expected. Perhaps an entity has come along that isn’t the one you thought you were talking to, or worse yet, maybe something negative has decided to pay a visit. Much like an uninvited houseguest, sometimes you’ve just got to send them away. Obviously, your first line of offense is a good defense. Before you get started doing any sort of spirit work, be sure to cleanse the area you’ll be practicing in. This can be done by way of smudging, prayer, or casting a circle. Creating a sacred space, in which the boundaries are clearly defined, is a good way of keeping out anything you don’t want to stop in and hang around. Why Is It There, Anyway? Something you may want to consider is whether or not this particular entity has chosen you for a reason. Despite our best efforts, sometimes things can sneak in. It may be a spirit who has attached itself to a guest at your séance, or just a curious entity that wants to know what you’re up to. Other times, it can be a deceased person who wishes to send a message to their loved ones–that they are okay, that they are moving on, or that they are loved. Perhaps after they've delivered the message, and they just don't feel like leaving afterwards. Some people believe that spirits linger around if a person has died in a sudden or traumatic way, leaving them unable to move on, thus causing them to be tied to the place in which they died. 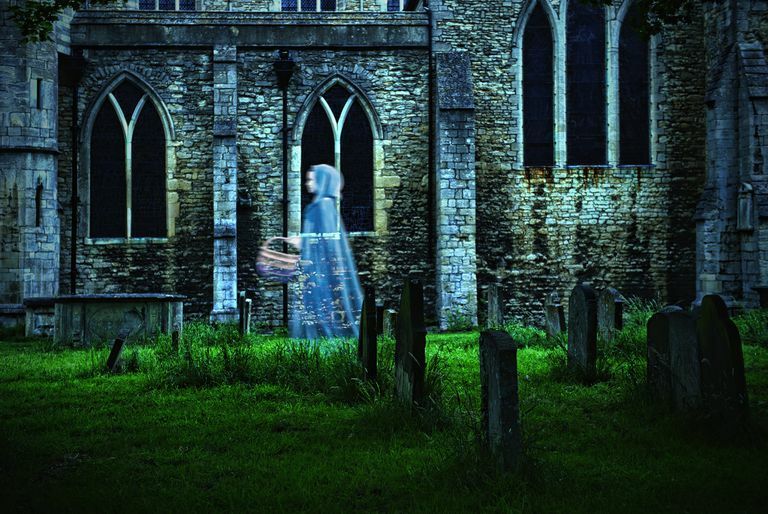 Another theory is that ghosts are people who have had a strong emotional attachment to a certain place–this could explain why the ghosts of certain famous people show up in multiple locations. "Think about a time when an uninvited individual stood too close to you. I’ll bet it made you feel uncomfortable. This person was standing inside your auric field. The feeling of physical discomfort you experienced was an indication that your energetic boundary had been violated. We are often consciously aware of this kind of violation and even more so when we are touched or hugged without permission. The feelings of anxiety or uneasiness we experience develops because our boundary is being crossed. Our personal space is being invaded." If this is the case, there are a couple of ways you can get rid of unwanted spirits. The first way–and one most people don’t even consider–is very simple: tell it to leave. Be firm and blunt, and say something along the lines of, “This is not the place for you, and it’s time for you to leave.” You may wish to offer a blessing or well-wishes if it makes you feel better about things, and say, “It is time for you to move on, and we wish you the best in your new place.” Frequently, this will do the trick and your problems will be solved. Sometimes, though, you may encounter an entity that’s a bit more stubborn. It may be really interested in hanging out with you, and in this case, you may need to take slightly more aggressive steps. In situations like this, you may want to create a cleansing ritual to rid the place (or person) of the attached spirit. By incorporating smudging and other purification practices, along with being assertive towards the entity (“I order you now to leave this place!”), you should be able to eliminate the spirit attachment. Every once in a great while, people run into a spirit that’s not just stubborn, but downright hostile. In this case, you’ll need to bring out the big guns. Cleansing, smudging, and banishing are all called for. This may even be something you’d like to get assistance with–a small group of psychically gifted individuals can work wonders when it comes to getting rid of the nasties. Again, the key here is to be assertive and reclaim your space from whatever entity has attached itself. This means you’ll have to take charge of the situation. Don’t be afraid to shout out, “You are NOT welcome here!” to whatever’s hanging around. Once you’ve gotten rid of whatever it is that has been lurking, make sure you do a final cleansing of the space to help prevent further recurrences from unwanted visitors. Use the tips included in Magical Self Defense as a way to keep negative entities away.